1 Heat a griddle pan until hot. Cut the aubergines lengthways into 0.5cm-thick slices, brush with olive oil on both sides and season. Griddle in batches for 2 minutes on each side, until tender. Transfer to a serving dish as each batch is done. 2 Meanwhile, finely chop the parsley, mint and capers. Mix in a bowl with the garlic, mustard, vinegar and oil; season and loosen with water to thin to a thick pouring consistency. 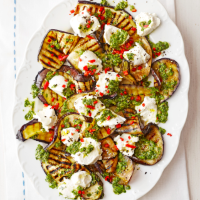 Top the cooked aubergines with the green sauce, ricotta and chilli.